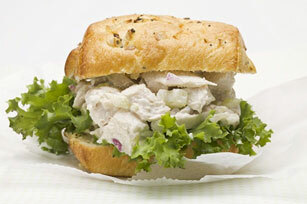 A little crunch and a lot of creamy gives these simple chicken salad sandwiches their home-style appeal. Leftover chicken never tasted so good! Combine all ingredients except buns and lettuce. Fill buns with lettuce and chicken salad. Serve these tasty sandwiches with simple sides, such as fresh fruit and assorted cut-up fresh vegetables. Add 2 Tbsp. chopped fresh tarragon leaves to chicken mixture before using to fill buns.